I think it was the leaves that finally got me out the door. Sure, there was Steve’s gentle encouragement: You need to get out and do some wandering. And, there was the seasonally inappropriate sunshine and warm weather. It is as though Warsaw took umbrage with my account of its Autumns as cold and blustery. It has answered with the most idyllic Fall in anyone’s memory. It has been an Autumn that refuses to be ignored. But, ultimately it was the leaves that moved my Wandering Day from the should to the must category. They were well into their ceaseless march from verdancy to a fierce shade of Autumnal. Fall foilage makes no pretense towards permanence. It is a temporary invitation only. Each passing day threatened to sweep them all away with one harsh wind, leaving us with nothing but bare branches and the inevitable grey skies of winter. It was the leaves, then, that brought the urgency. And, it is unfortunate but true that the urgent can shatter the mundane in a way that the important may not. I needed a bit of prodding, you see. Proponent though I am for Wandering Days, I had let them slip from my routine. There were reasons, of course. There are always reasons. The meandering tumult of summer was replaced by the intensity of preparing for Benjamin’s departure. By the time I looked up again, a million little encumbrances had crowded in to occupy the space my Wandering Days had once inhabited. And so a little reclaiming became necessary. Detaching myself from the circuitry of productivity for a day required intentionality. There was no small amount of retraining to be done as well. The planning part of brain needed my kindest assurances that I appreciate its contributions, but this was its day off. Even then, it made several ploys at wresting control. It was forever plotting the most efficient path through the park to capitalize on the most impressive vistas. I had to remind it (repeatedly) that we were letting Wandering lead the way. This was a day for digressions and rambles, not dictated directions. Feeling still a bit wobbly on my Wandering feet, I went back to my well wandered grounds. 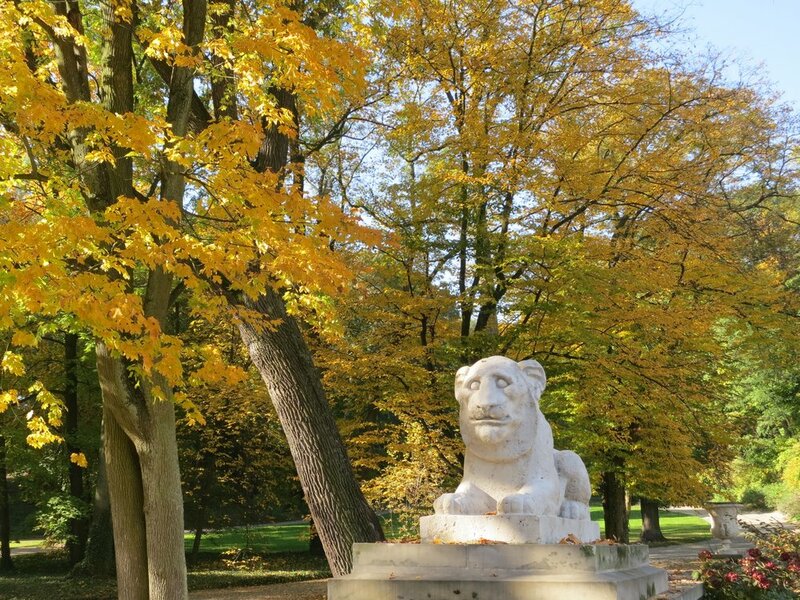 The familiar paths of Łazienki were a gentle reintroduction into the ways of Wandering. It’s a bit of an art, you know. Wandering. It doesn’t come naturally to the modern soul. It necessitated a series of reminders. There are trees ringed in halos of gold. Do you see them? This view. The one right here in front of you. It is enough. Participate in the practice of sitting on a bench. Allow your breath to be swept away by the change of perspective created simply by sitting down. Pause to discern the quality of the sun in a particular spot. Feel the weak rays now that promise the warmth that will come. Perhaps, reading this in animated pixels, my description seems a bit hyperbolic. I don’t intend it to be. It is the closest I can come to capturing my actual, real experience. And, it does, at times, literally take my breath away. It is that big and that dramatic. Walking on a Wandering path I feel my soul expand. There is so very much about this world that I do not understand and that my heart cannot comprehend. I wonder, even, if moments like this are pure decadence in light of the world we inhabit. I think they may be. But, I don’t know that it makes it wrong. I know only this, that need this practice in my life.So very much good is to be found in sitting still on a park bench.